No smoker house. No pets allowd. Click the house map to see the rooms' photos. At the ground floor, living room and kitchen, both opening onto the courtyard. At the first floor, 3 bedrooms (6 persons), shower room, toilet and TV room. We recommend socks or slippers to avoid marking the wooden floors. Every year, a phase of renovation concerns one or two rooms of the house. Bedroom A: two single beds 90/190. Bedroom B: 1 90/100 bed and 1 80/180 bed that slides under the first one. Bedroom C: large bed 140/190 with 6 drawers. Living room with wood stove (logs provided) and dining room communicating with the courtyard. Open plan kitchen up to 5 stools. 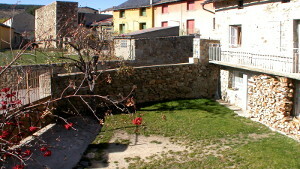 Courtyard enclosed by a stonewall and closed by a gate, facing south. Screening of the windows of the rooms by shutters. Gas heating completed by electric radiators in the bedrooms. Electric boiler for warm water. The parking for 2 cars is in front of the north entrance. It is also possible to park the cars in the courtyard. Peaceful environment, overlooking the mountains. Wi-Fi will be connected when receiving in return the user charter. inventory to find what is available in the house. Also consult the access map. Shops: Shopping and supermarket in the area. The main tips booklet (French edition) Mode d'emploi du gîte (PDF) is also available on the premises. Randonnées et promenades (PDF). : For more than 50 ideas to discover the mountain and the region. The gîte Navarre is not suitable for disabled people.